For those of you who are single parents, divorced, or know others who are in a similar situation, here are some links that might be of great benefit. Please pass along and share to anyone who is going through such a situation. Sometimes all we need is someone who can be there for us and can guide us when we feel the weight of the world upon us. Here are some additional resources on homelessness for those either struggling with paying for housing and food or for those wanting to lend a helping hand. Remember, even if you can help one person or one family, it creates a world of a difference. I recently received an email from a wonderful person who is currently doing work on facilitating resources to secure housing for homeless veterans. For those of you who want to give a helping hand, below are a few that might be of great benefit. List of Housing Resources throughout the U.S.
Resources for Homeless Veterans in the U.S.
And if you are located in the UK, here is a great website that helps connect homeless people sleeping on the streets to local services and support. Here's a crazy statistic: According to the US Interagency Council on Homelessness, there are over 500,000 people who are currently homeless in the United States. Click on the Homeless Shelter Directory for more info. You cannot even fathom that many people without a home, living day-by-day with the compounding stresses involved with feeling like an outcast to society. But the silver lining is that no action is too small to make a difference. This post is for those of you who want to lend a helping hand to the homeless and want to know the different ways you can make an impact on the homeless community. Remember, no one has become poor by giving. For those of you interested in volunteering abroad in South America and Southeast Asia, here is an organization worth looking at. Whether you are willing to teach English and French, work at an orphanage, volunteer at an organic farm, care for the mentally/physically disabled, and/or advocate for animal welfare, this would be a great opportunity to immerse yourself in not only exploring the world and learning new cultures, but also in dedicating your time to helping the less fortunate and disadvantaged. Regardless of our inherent passions in serving the world and fighting for injustice, we always need those times to refresh ourselves of the change we wish to enact in this world. For more info on the programs they offer, click here. The organization is founded by like-minded youth who come from diverse backgrounds and have passions in cultural diversity, advocacy, and social inequality. For more info on the board, click here. Both Converse and ShoebizSF have collaborated to create a special series of Converse sneakers that celebrate iconic moments in San Francisco's history, such as the Earthquake of 1906, the Gold Rush, and the Golden Gate Bridge (shown respectively from left to right). 100% of all proceeds will be donated to Youth Against Poverty which we will donate to Compass. The money will support homeless and impoverished working families in San Francisco at a time when the shelter waiting list is at an all-time high. Shoe Biz SF signs on for August event! The hard-working board at Youth Against Poverty has decided to reschedule the pop-up charity store to this coming AUGUST. We believe that this will be a greater opportunity since we can have an event during the "Back to School" shopping period. We will have the same beneficiaries and the drive to collect art supplies for the DoSomething.org/Art Feeds collaborative project. We are excited for another event to support Haitian orphans and San Franciscan families, trying to tackle both local and global poverty issues! We will announce dates and location ASAP. Thank you all for your continued support! We continue to appreciate and work with amazing corporate partners like Converse, Reebok, Adidas and Puma, but we recognize the need to expand our company outreach. It is important to have diverse products and ensure that we do not exacerbate the generosity of our amazing partners! If you are a company seeking a charitable way to utilize overstocked, out of season or sample products, or could reccommend a company that is, please contact Amanda Chavez at amandachavez2013@yahoo.com. Youth Against Poverty is excited to announce that we will be holding another one of our signature "pop-up" charity stores! Once again, all of our products will be donated from our generous corporate partners and a volunteer staff will operate the store. One unique twist on this event is that it will be a joint fundraiser. Our proceeds will go to benefit both our local and global community. Our local partner is Compass Family Services, an organization based in San Francisco that helps provide services such as counseling, childcare and matching permanent housing to economically disadvantaged families (http://compass-sf.org/). Our other partner is Global Family Philanthropy, an Arizona-based nonprofit working to improve the living situation and health of orphans in Haiti (http://globalfamilyphilanthropy.org/). We will be supporting their efforts to build and run a successful clinic in North East Haiti. We will also be holding an art supplies collection drive through DoSomething.org's Healing Oklahoma initiative. This drive will be providing unused supplies for on-the-ground organizations in Moore, Oklahoma. The children affected by the tornado will receive free access to theraputic and educational artistic programs to help recover from the trauma that they have faced (http://www.dosomething.org/ok). We are excited for this new project, and encourage you to return to this website as well as visit our Facebook (https://www.facebook.com/pages/Youth-Against-Poverty/120734315517?fref=ts) and Twitter (@Youth AgainstPov) often. We will announce the dates and location of the next "pop-up" charity store ASAP. All of us here at Youth Against Poverty are excited for some new projects and goals! One way to help expand our outreach is through developing social media. We encourage our supporters to check out our new Twitter (https://twitter.com/YouthAgainstPov) and see the developments on our Facebook Page (https://www.facebook.com/pages/Youth-Against-Poverty/120734315517?fref=ts) We really appreciate your continued support for our organization! Our work would not be nearly as effective without your constant actions and encouragement! Youth Against Poverty will be awarded the Community Impact Award by Compass Family Services on 4/23 at the Fairmont Hotel for raising over $25,000 towards helping children who come from homeless, working families in San Francisco, as well as donating 123 pairs of shoes to many of these children. YAP wants to thank Converse for its collaboration on various fundraisers that have helped us raise this much money, ShoebizSF for helping sponsor the fundraisers, Passerrelle and all YAP members for their support and help. YAP will donate $17,000 to Global Family Philanthropy in support of building a medical clinic in Haiti. This money we raised is from the previous pop-up fundraiser we had in June in Los Altos, Ca. GFP has found a potential place to build a clinic in Northern Haiti, which is close to the Dominican Republic border. This clinic will serve as a stepping stone in alleviating the rapid spread of cholera, malaria, and Dengue fever that is prevalent in Haiti today. Below is a check for $17,000 to GFP. On December 21, YAP collaborated with Shoebiz in launching the limited edition End of the World Shoes, designed by Alan Gonzalez and Kris Mestizo. Compass will use this money to give full-day childcare for 70 children ages 0-5 as well as a specialized early childhood curriculum and up-to-date immunizations for all children. We want to give our special thanks to Twitter for helping spread our event and cause by structuring our social media outreach. Below is a cashier's check to Compass Family Services. 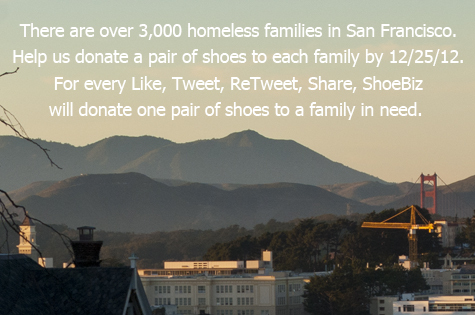 ShoeBiz will support YAP and donate 10% of ALL SALES on 'Giving Tuesday' 11/27/2012 to provide housing for working homeless families with children in San Francisco. To remind everyone there are 5,000 homeless families in San Francisco.